ABOVE: The greater sage-grouse has been used as an umbrella species in Wyoming, with mixed results for other species. Regardless of how sturdy your umbrella is, someone’s always going to get left out in the rain. The concept of umbrella species is the central tenet of a conservation strategy that focuses on protecting the habitat of one species in the hope of protecting many others in the same ecosystem. But recent research questions the effectiveness of this strategy. It’s likely that not every species whose range overlaps with that of an umbrella species will benefit—in fact, some may even suffer as a result of the interventions—and conservationists are beginning to call for a revaluation of this conservation approach. 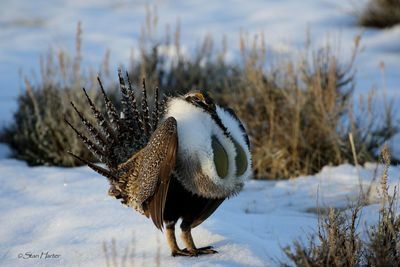 Male sage-grouse dance for the attention of potential mates. A study published this May on the use of the greater sage-grouse (Centrocercus urophasianus) as an umbrella species illustrates the problem. After three years of ecological monitoring in an area where the sagebrush had been mowed to improve nesting habitat for the sage-grouse, researchers from the University of Wyoming found that two “background” species, the Brewer’s sparrow (Spizella breweri) and sage thrasher (Oreoscoptes montanus), fared less well than they would have without the habitat alteration. 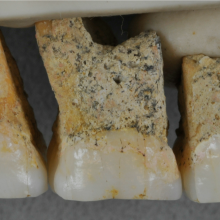 This was likely due to differences between the species in nest site preferences. While ground-nesting sage-grouse are thought to prefer mowed sites due to the increased availability of food for their chicks, Brewer’s sparrow and sage thrasher nest almost exclusively in shrubs, habitat that was largely wiped out by the mowing. The overall abundance of Brewer’s sparrow remained the same, but the overall abundance of sage thrashers decreased by nearly 50 percent. “This paper focused on the fact that we don’t always just protect, we often manage the habitat, and that can have unanticipated consequences,” says Jason Carlisle, a former University of Wyoming graduate student and lead author of the study. While not surprised at the results, he hopes that they will encourage others to adopt caution when carrying out habitat management. We must be honest about what assumptions we make, whether they’re justifiable, and whether they can be examined in advance using data. Just because it can act as a double-edged sword, however, conservationists shouldn’t throw the umbrella species concept out of the conservation toolbox, says University of California, Davis, behavioral ecologist Tim Caro. 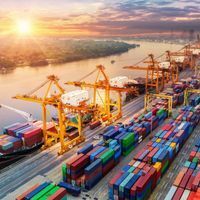 Rather, he says, researchers and managers should be aware of the approach’s limitations and critically evaluate its effectiveness in meeting intended goals. 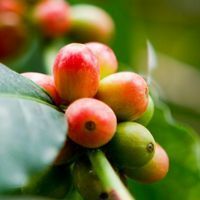 Evaluating those trade-offs depends on what background species are considered. For example, the jaguar (Panthera onca) is often cited as an effective umbrella species for many large mammals across Central America, but smaller critters, such as hares, moles, and shrews, aren’t as well shielded by habitat protections designed to conserve jaguar numbers. Similarly, a study assessing the effectiveness of using the coho salmon (Oncorhynchus kisutch) as an umbrella species in British Columbia found that while fish species with similar resource and habitat requirements benefitted, most amphibians inhabiting some of the same freshwater ecosystems as the salmon did not. And Carlisle and his colleagues have found that species with similar habitats and traits to those of the sage-grouse, such as sagebrush sparrows (Artemisiospiza nevadensis), vesper sparrows (Pooecetes gramineus), and pygmy rabbits (Brachylagus idahoensis), were protected better than others. 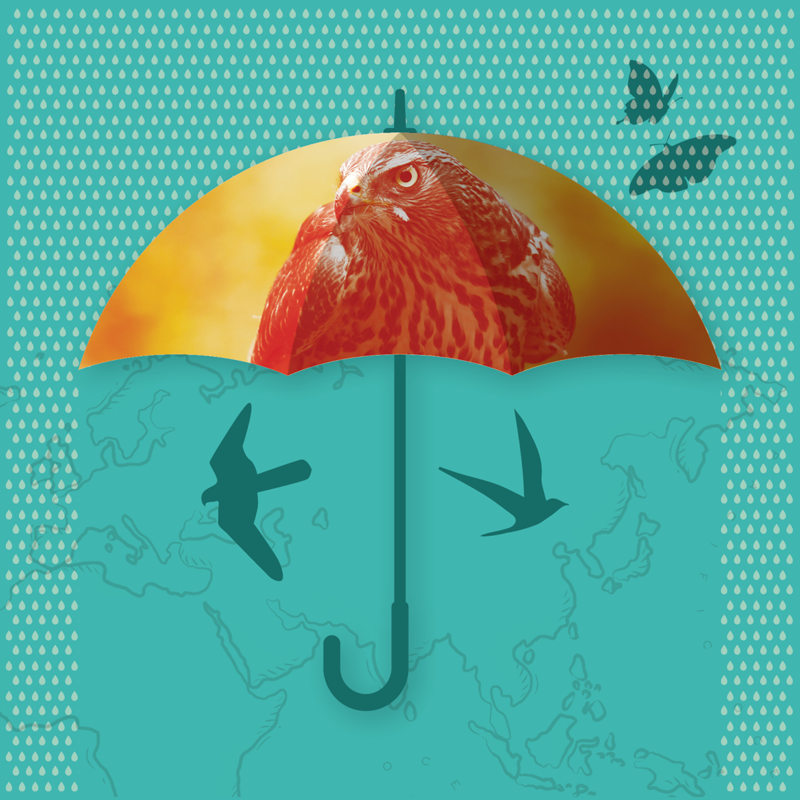 For an umbrella strategy to benefit as many co-occurring species as possible, researchers must choose a species that best represents the ecosystem and all it encompasses. “It’s clear that picking the right umbrella species is key,” says Carlisle, now a biometrician at the environmental and statistical consulting firm Western EcoSystems Technology, Inc. While researchers are still working out what makes a species a good umbrella, there are a few characteristics that conservationists generally aim for, including a large range and ease of sampling. In addition, umbrella species should be sensitive to human disturbances while being unlikely to become endangered or go extinct. Although shrubs help camouflage sage-grouse, mowing is thought to increase the availability of food for the birds’ chicks, and is thus a common conservation strategy. Sage thrashers (Oreoscoptes montanus) did not benefit from the habitat alteration designed to help the sage-grouse. Barry Noon, an ecologist at Colorado State University, suggests adding one more trait. “The umbrella species should be one that uses a diversity of resources or habitat types for different life history stages.” Other scientists have argued for the use of multiple umbrella species, whose spatial, compositional, and functional requirements are different from one another and, collectively, encompass those of all other species in the ecosystem. Whatever species are chosen, researchers must continue to evaluate their suitability to represent the ecosystem. Noon and his colleagues have demonstrated, for example, that while the northern spotted owl (Strix occidentalis caurina) was initially an effective umbrella in the old-growth forests of the Pacific Northwest, after a significant drop in its population—first due to logging of old-growth forest required for nesting, then as a result of the barred owl’s (Strix varia) unexpected invasion—it was no longer a suitable representative of the ecosystem. “Initially the northern spotted owl was a good umbrella,” says Noon, explaining that this was because it uses forest habitats of varying levels of maturity throughout its lifespan. “Now, if we use the [umbrella] criteria and look at its viability, northern spotted owls are in significant decline,” he says. 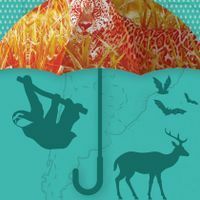 Rare and declining species are less likely to make effective umbrellas, as they occur in so few locations and are less likely to protect others. Taking a step back from the umbrella species concept to focus on simply protecting a large area could be a better approach for wildlife conservation than focusing on one or several species, says Noon. In fact, many of the more successful umbrella studies suggest that focusing on a broad area, rather than the umbrella species themselves, as the reason the conservation efforts proved effective, he notes. Indeed, Caro’s analysis of East African reserves that were established 50 years ago using large mammals as umbrellas suggests that background species have been well protected because most reserves were initially large. Similarly, in a study published last August, Carlisle and colleagues found that priority areas for conservation (PACs) set up to protect the greater sage-grouse in the western U.S. were no more effective than randomly selected PACs of the same size at protecting golden eagles (Aquila chrysaetos). 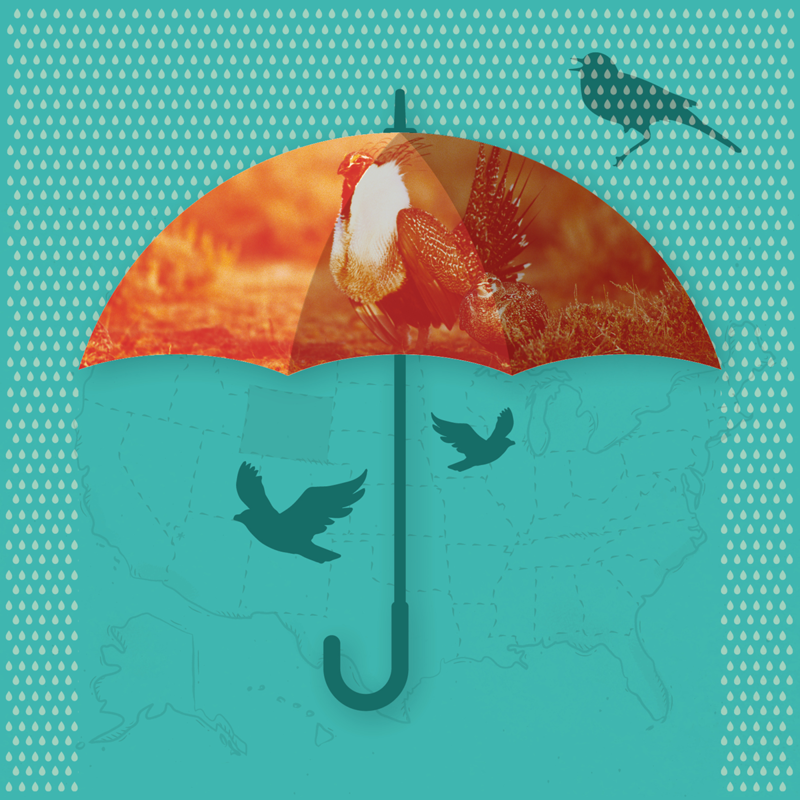 But selecting an umbrella species is often helpful for getting political and social support to protect areas, Carlisle says, noting that focusing on the iconic sage-grouse was what garnered support for the protection of the 70 million acres of the Midwestern grasslands in which it resides. This makes it a “flagship-umbrella” species, meaning that it combines the functions of a flagship species—to promote public awareness and raise conservation funds—with the intended role of an umbrella species, to protect co-occurring species and habitats. Caro argues that such flagship-umbrella species could be a boon to conservation efforts. Indeed, a 2016 study demonstrated that the flagship species the giant panda (Ailuropoda melanoleuca) could also be an effective umbrella species because its range overlaps with many other endemic species in China. 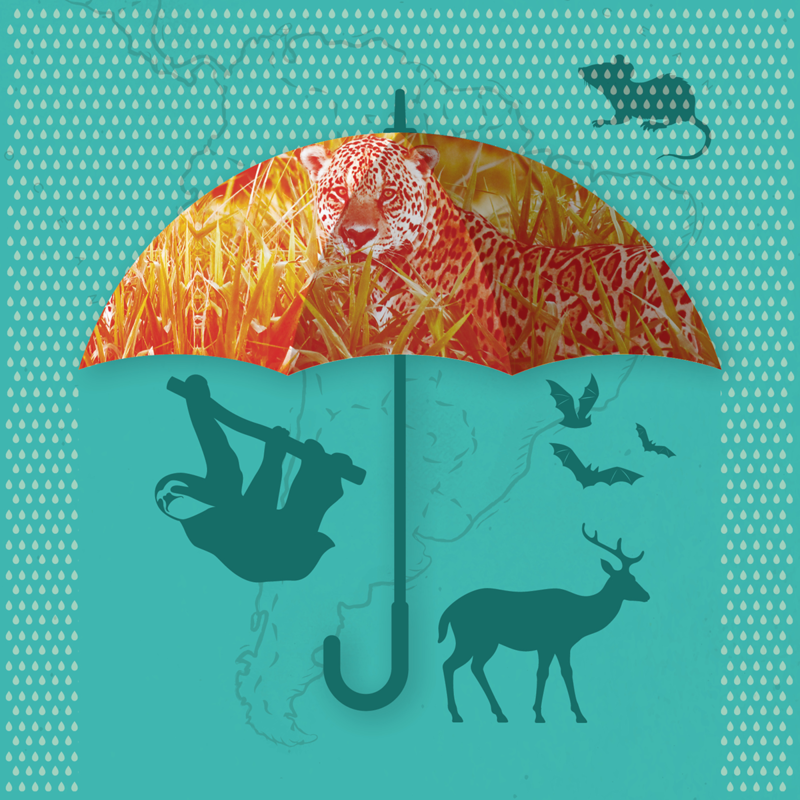 Umbrella species are often chosen to represent an ecosystem in need of protection. The idea is that protecting the umbrella species will indirectly benefit habitat and other species in the area. But the strategy has its weaknesses. There are three varieties of the umbrella species concept as coined by Tim Caro in his book Conservation by Proxy—classic, local, and management— each of which is liable to fail if implemented incorrectly or in the wrong circumstances. Assumes that if researchers can protect the area that contains a viable population of an umbrella species, that effort will also maintain viable populations of other species in the area. Risk: The reserve might not be big enough to cover viable populations of other species of concern. Example: The jaguar (Panthera onca) served as an effective umbrella species for protecting other large mammals in Latin America but was less effective at shielding smaller animals such as rodents, likely due to differences in the size and scale of their respective habitats. Makes no viability assumptions, instead simply assuming that protecting the areas where an umbrella species is present will also protect many other species in the same area. Risk: Other species of conservation concern might not co-occur with the umbrella species and might therefore be unprotected. Example: The northern goshawk (Accipiter gentilis) was found to be a good local umbrella species in the Italian Alps, offering protection for other birds species as well as butterflies and other background species. In northern Japan, however, despite being an effective umbrella for a variety of birds, goshawks were not effective as an indicator of the species diversity of butterflies, beetles, or native forest-floor plants. Assumes that planned human management and intervention targeting an umbrella species will benefit a suite of other species in the same area. Risk: The management actions taken to benefit the umbrella species might harm other species. Example: In Wyoming, mowing intended to benefit the greater sage-grouse (Centrocercus urophasianus) resulted in a higher abundance of vesper sparrows but lower abundance of Brewer’s sparrows and sage thrashers, likely due to differences in land use.